The 1703 inventory of Nicolas Volant, a merchant of Québec, is among the earliest to describe a "tapay fasson de Turquie," set on a turned cherry table. Philippe de Rigaud, marquis de Vaudreuil and governor-general of New France, owned "un grand tapis de Turquie" valued at fifty livres in 1725. 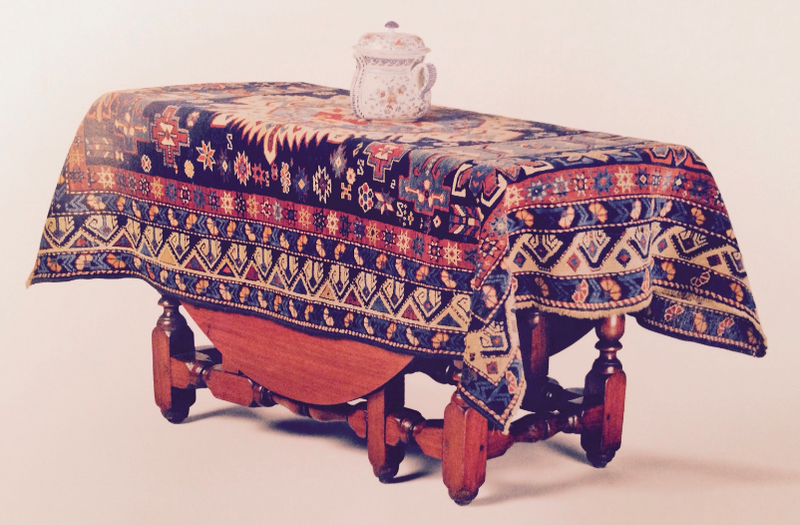 A cherry table belonging to Nicolas Jérémie, a merchant form Québec, was covered "with its point de Hongrie tapestry carpet" when he died in 1732. Marie-Madeleine d'Amours de Clignancourt of Québec owned a blue drap carpet in 1757. In 1764, royal notary Pierre Tiphaine of Saint-Pierre in Martinique owned a pine table covered with a green cloth. A curious rug used to cover a table in the Québec home of Michel Balan in 1725 is described as being of "tigerskin." Woven floor coverings were rare in New France. Rugs and carpets appear in a few households, but were not generally used on the floor. Instead, they are often described as draped on tables and occasionally chests of drawers. Green and blue serge coverings were not uncommon, and tapestry rugs are also mentioned. The 1749 inventory of Pierre Gaultier de Varennes, seigneur de La Vérendrye, lists an old blue drap carpet atop a pine table. The best sort of rugs were what are now commonly labeled "Oriental" or "Turkish" carpets. "Tapis de Turquie," as they are identified in French colonial documents, were also used atop tables. 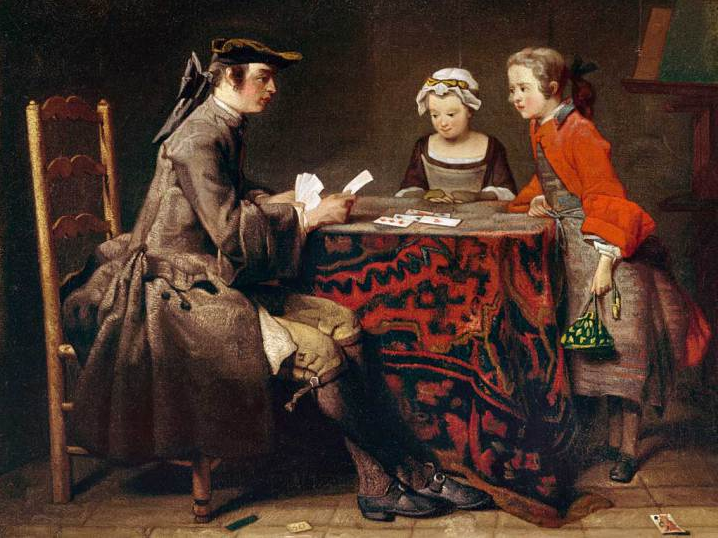 Two genre scenes by the French artist Jean-Siméon Chardin illustrate this practice. A group portrait of Isaac Royall, Jr., of Massachusetts and his family by New York-born artist Robert Feke provides an interesting Anglo-colonial counterpoint to New France. Like painted or printed cottons, ownership of such rugs allowed elite French colonial consumers to participate in the fashion for the "exotic." 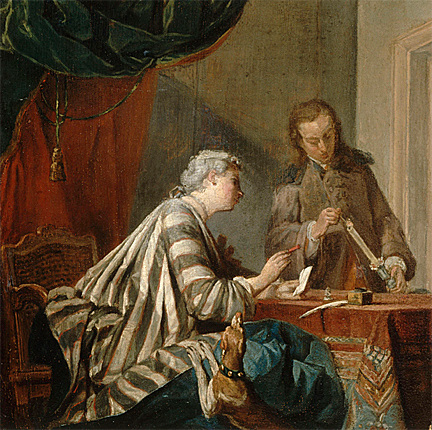 Philippe Peiré, a bourgeois of Québec living in the rue du Cul-de-Sac in 1732, owned a "tapis de point de Turquie," and a "tapis vieux façon de Turquie" was sold from the estate of Geneviève Marchand, the widow Marcoux, in 1756. 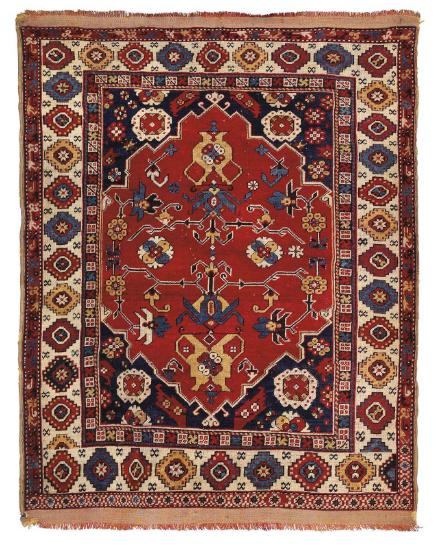 A wool prayer rug from western Anatolia replicates the appearance of the rug seen in the Royall family portrait and, possibly, those owned by Philippe Peiré and the widow Marcoux. A similar carpet in the collection of the Brooklyn Museum, laid atop an Anglo-colonial table from the late seventeenth or early eighteenth centuries, evokes the actual context of these exotic imports, in most cases deemed too precious to be laid directly underfoot.